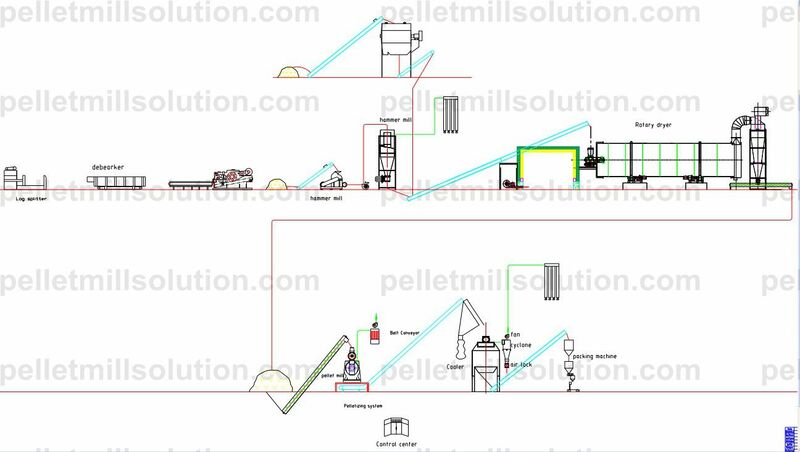 How to Improve the Output of Pellet Production Line? Pelletizing is the process of compressing a material into solid waste. A wide range of waste material can be pelletized. The pellets are then used for thermal combustion. The most common products of pelletizing are wood pellets. The is because wood pellets are easily available and are made from different types of agro-forestry waste including soybean husks, tea waste, palm husks, wheat straw and bamboo dust. Other wood pellets include forestry waste, biomass rubbish, peanut shells, sawdust, coffee husks, sunflower stalks, tobacco waste, cotton stalks, paddy straw, rice husks, woodchips, coconut residues and other agro-wastes. The process of making wood pellets is very simple. However, wood production line that is commonly known as large scale pellet mill plant is needed to produce wood pellets for creating energy from raw materials such as sawdust and wood chips. Pellet production lines differ in sizes from 3 kilowatt to 375 kilowatt, that is 5 horsepower to 500 horsepower, or even bigger. Also, production volume for pellets per pellet product line can differ from 90 kilos per hour to 8 tons per hour. Loose wood raw material can be processed from 100 kg/m3 to 650 kg/m3 offering an extraordinarily dense and very efficient item. The good news is that wood pellet plant can work nonstop, and numerous machines can work together at the same time. Conveyors and feeding machine can feed the plant automatically. This reduces the workload. How to improve the output of biomass wastes pellet production? Different biomass wastes or materials have different features that affect pelletizing process. Therefore, proper mixing of coarse fiber content and fine fiber content is needed to improve the output. The most important factor affecting the efficiency of pellet production is the moisture content. You should always check the moisture content of material before feeding the hopper. Also the moisture content should be uniform for the material. This is to ensure the plant runs properly. For instance, you can drive 100 kilometers or even 150 kilometers in a highway without any problem, but you cannot do that in a place with many people. The attitude is the same with the pellet plant. By crushing the raw material into appropriate size is the best way you can improve the efficiency of the pellet plant. For different shapes and texture of raw material, the best machines to use are crushing machine, debark machine and wood sheered. First, let understand the concept of compression ratio. Compression ratio refers to the ring die pellet mill. It means that the actual lengths of the ring die verses the actual diameter of the ring die holes. It therefore state that the bigger the compression ratio the bigger the output of pellet plant. The compression ratio has a direct connection with the output of the pellets. The output of pellet plant will also depend on the operator’s skill and experience. The operator must set the machine according to the room temperature, moisture content, particle size and formula, and changes of temperature. If we can master the technique of pellet plant, we can easily improve the output.